Home » News » Get On the Move! With the weather warming up, the guys at OE have been busy moving lately! At the end of April they moved Rust-Oleum Corporation out of their old office in Williamsport, MD and into their new space in Martinsburg, WV. We’ve also been busy in Chambersburg. The guys moved Physical Therapy, Etc. 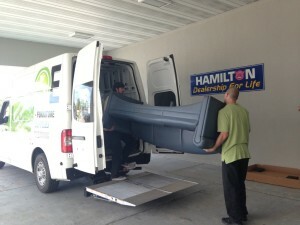 into their new office on Franklin Farm Lane, and delivered brand new HON sofas to Hamilton Hyundai on Lincoln Way East. To find out more about Office Environments’ moving services, give us a call today! We’re now Minority Business Enterprise (MBE) Recognized! Congrats to Eric – 5 Years at Office Environments! Click the image to request a copy of our catalog. Office Environments customers may login below.